My DD has several big special occasions coming up in these next few weeks, including graduation, Confirmation, and a birthday. On Mother's Day, I had precisely three hours to craft (one of my wishes for that day - would've liked more than three hours, but hey...), so I pulled out my Coral Couture stack from DCWV to put together some quick cards for her. The paper stack comes with a page of die cuts, so I matted this one on white cardstock, then got fancy with two Spellbinders tags behind it. The sentiment and frame are from new-to-me Verve, Small Celebrations. 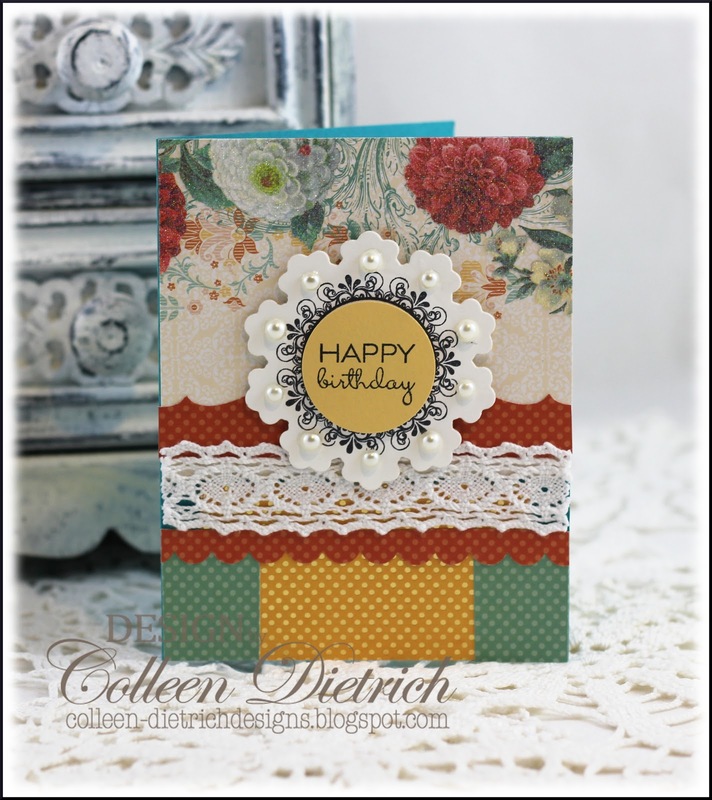 I think the Coral Couture papers fit this color assortment pretty well; how 'bout you? 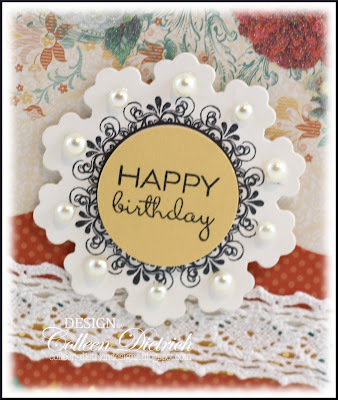 Other: Big Shot; Floral Doily Motif die - Spellbinders; 1 3/8" circle punch, scallop border punch - SU; bracket punch - EK Success; pearls - Queen & Co. Awesome job! Love the 3rd layout and the photo is gorgeously crisp and clear! Gorgeousness! Way to work that colour combo not just once but twice!! I'm jealous of your 3 hours of inky time LOL! Laughing because I am actually joining in the color challenge, but have to wait till tomorrow to post to work with another that goes live tomorrow. Mine won't be quite as elegant as yours. I went more fun, CAS for a change. Lots of good stuff happening in your house, wohoo of three hours of crafty time. I would have taken what I could have got! Beautiful cards, love that paper stack! Lovely cards!! Love the way the Verve circle image fits on that spellbinders die- need to open my mind more!! 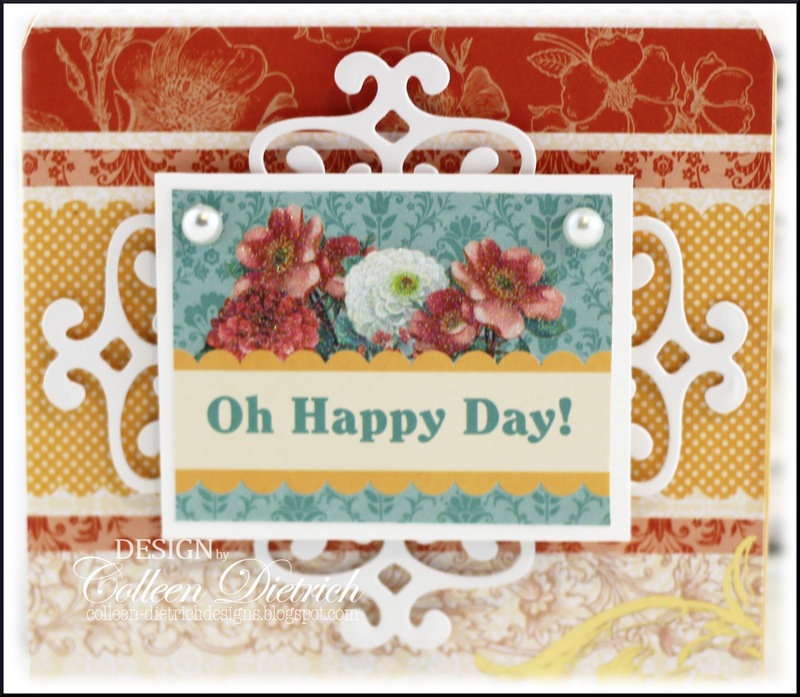 Beautiful cards...I really love the first one...what a great color combo and love the die cut behind the sentiment...totally love..
Beautiful colors! The cards are gorgeous! 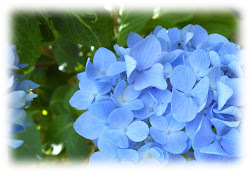 Absolutely lovely creations---I recognized those PP colors right away! I am glad you got 3 hours of stamping time on MD---that's what I wanted too, but it didn't work out that way!! Colleen, these are beautiful! Wonderful papers and brilliant ideas you had for making the most of them. Congrats to your DD!!! Graduation moments are some of the best! Hugz!!!! Gorgeous cards Colleen!! 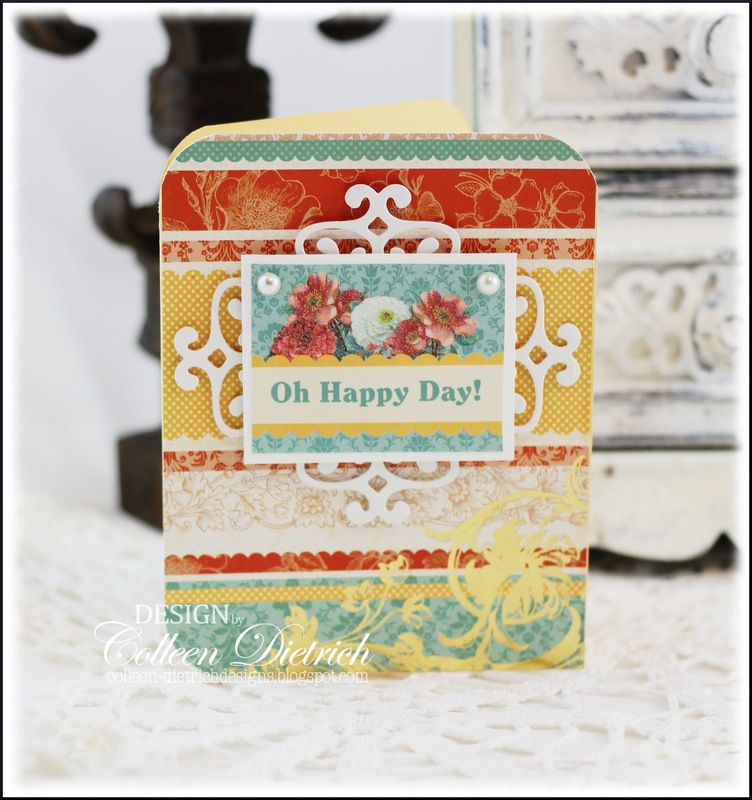 Love the papers and how you used the Spellbinders! Simply gorgeous! I love the papers you used. More later, I am one pooped pup! Beautiful cards Colleen, love the colours in particular on the first one, so pretty! Lovely elegant creations, your daughter will love them! The papers and the white lacy accents of the dies is such a pretty combo! Thank you for joining us at the Paper Players Colleen! Wonderful events going on in your household. Your daughter is sure to love these cards. I love that paper and I love coral. Off to your other blog. If I don't comment, I'll be back..have a doctor's appt. this morning. Ugh! Your cards look amazing my friend. I just love your style. Oh Colleen, these cards are stunning! The papers are just gorgeous! Wowza!!!! Both cards are incredible! What a nice Mother's Day present..time to craft! You certainly took good advantage of the time. Such pretty papers and the flowers and die cuts dress them up beautifully. Love these all! The paper is so pretty! 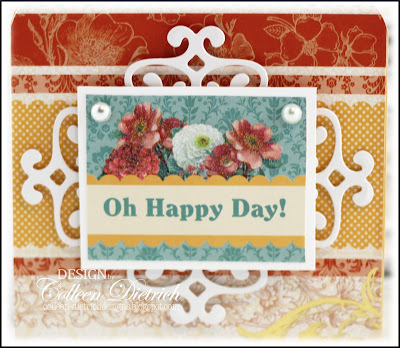 Absolutely gorgeous cards, Colleen! I love this paper. Thanks for playing with The Paper Players! Beautiful cards Colleen! I love that DSP and your use of the spellbinders is very effective. Thanks for joining us at The Paper Players this week! 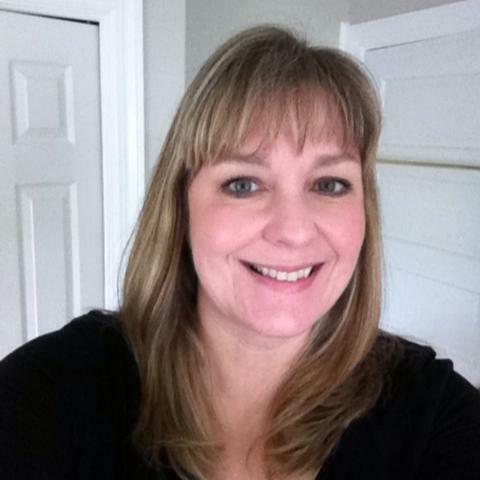 Such BEAUTIES, Colleen!! And I was noticing that your card photography is looking fantastic. You've learned so much and are using your new camera SO well!! Your daughter is sure to LOVE these sweet handmade cards. I really like the papers you used. I've got to keep my eyes open for that pad! so beautiful! i am dying to get my hands on some paper packs but sadly the shipping is always the same amount as the grand total of purchased items LOL I am in $$ collection mode at the moment! Thanks for the inspiration.